This is a re-working of last year's "On The Origin of Respectability". Most of it is the same, but I have included some updates. In the beginning God created the heauen and the earth. And the earth was without forme and voide, and darkenesse was vpon the deepe, and the Spirit of God moued vpon ye waters. Then God saide, Let there be light: And there was light. And God sawe the light that it was good, and God separated the light from the darkenes. And God called the light, Day, and the darkenes, he called Night. So the euening and the morning were the first day. 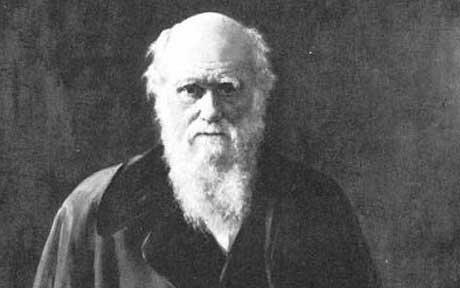 February 12 is failed theology student Charles Darwin's birthday. It is also "Question Evolution Day" and "Academic Freedom Day". (Actually, every day is "Question Evolution Day", but February 12 is given special notice.) It should be Creation Sunday as well, where Christians stand up for the truth of creation and refuse to compromise. Instead, many churches will disgrace themselves by promoting evolutionism from the pulpit. This is counterproductive, to say the least. What kind of message are we sending? "The Bible is true, we can trust it for our salvation and our doctrine. Genesis? No, that's allegory and not history." No wonder people have trouble believing in God and staying in the church! Since the primary thrust of this Weblog is theological and not scientific, I will let you check some resources on your own. But I will give you some suggestions: Piltdown Superman, Answers in Genesis, Institute for Creation Research, Creation Ministries International. If those are not enough, I have many more apologetics links here. What, you're bothered because I am not giving equal time to evolution? We are constantly exposed to biases, skewed reports, tendentious interpretations of the facts and outright ridicule of our viewpoints. This is equal time! There are church people who simply do not believe that the Bible is true (including having historical value), so they have no problem giving the appearance of scientific respectability to their churches. Some people believe in "theistic evolution", where God used evolution to cause his creation. Or they have God start the whole works and then he stepped back and let nature take its course. Some believe in "Progressive Creation", where God stepped in on occasion and did some more creating activity. These things require extreme eisegesis, making the Bible say what people want it to say. Naturally, there are compromisers who do not want to take a stand or who have not bothered to examine the evidence for Creation. Nor have they examined the implications of their compromise with evolutionism. However, there are honest, intelligent people who have looked at some of the evidence and insist that the Earth is ancient, disagreeing with creationism. Which of the gradually evolving primates was Adam, and which was Eve? When did Adam and Eve sin? If they are simply stories or archetypes, we are being lied to throughout the Bible because Adam is spoken of as a real man. This becomes much worse because Adam is in the lineage of Jesus (Luke 3.28), Jesus referred to Adam and Eve as real created people (Matt. 19.4). Paul refers to Adam as a literal person, by whom sin entered the world (Rom. 5.12-14). Paul also referred to Jesus as "the last Adam" (1 Cor. 15.45). Jude referred to Enoch and Adam as real people (Jude 1.14). As I have said before, the word יוֹם translated "day" means "indefinite period of time" (as well as assorted other meanings, like part of a day, the darkness part of a day and so on), or as an indefinite period of time, but Genesis has strong qualifiers to make it a literal day: "Evening and morning, the (number) day". Also, this is the way it works throughout the Old Testament. Why should the early chapters of Genesis be the exceptions? People will refer to Psalm 90.4 and 2 Peter 3.8, taking "one day is with the Lord as a thousand years, and a thousand years as one day" to support their belief that the days of Genesis were not literal. How about a logical extension, then? “Remember the Sabbath day, to keep it holy. You shall labor six days, and do all your work, but the seventh day is a Sabbath to Yahweh your God. You shall not do any work in it, you, nor your son, nor your daughter, your male servant, nor your female servant, nor your livestock, nor your stranger who is within your gates; for in six days Yahweh made heaven and earth, the sea, and all that is in them, and rested the seventh day; therefore Yahweh blessed the Sabbath day, and made it holy." (Exodus 20:8-11, WEB) Look at the text again. God worked for six days and rested for one day as an example for us to follow in the Fourth Commandment. Those who compromise with the Bible have two problems here: Did God work for six thousand years and then rest for one thousand years? Or did he work for six indefinite periods of time and rest for an indefinite period of time? If God used evolution, then why do we need God at all? If Genesis is not true, how do we know we can trust the rest of the Bible? As for me, I am not willing to let science interpret Scripture. After all, science is man-made. God's Word is eternal (Isaiah 40.8 NASB). If we changed our understanding of God and the Bible with every scientific "discovery", we would be a mess and Christianity itself would have collapsed long ago. With all of the compromise and strange doctrines running rampant in the church today, I should not be surprised and disappointed that churches are not willing to stand up for our very foundations. I am not going to go the other way, however, and say that we must hold to our views no matter what all science reveals. Perhaps our understandings of Scripture need to be adjusted on occasion. But carefully, with the bigger picture in mind.